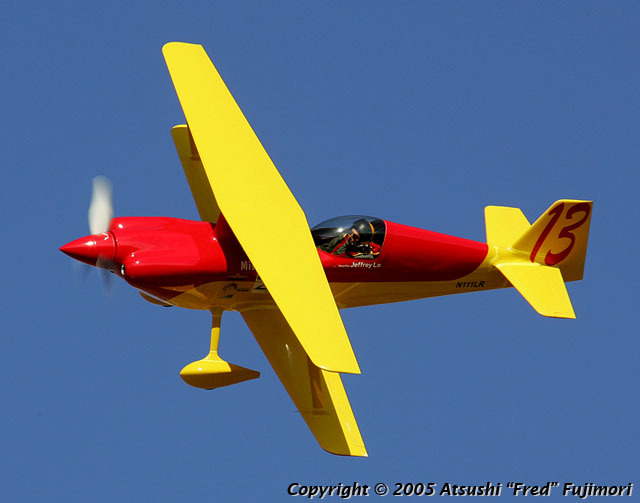 On September 16, 2007, Cris Ferguson piloted "Miss Gianna", race #13 to victory at the National Championship Air Races in Reno, NV. Watch for the Flyin' Lo Racing Team and the World's Fastest Pitts Special at the National Championship Air Races September 10-14, 2008. We will once again be fielding three airplanes, the 2007 champion in the Biplane class, Jeff Lo's "Miss Gianna", race #13, and Jeff's veteran three-time winner of the Biplane Silver race, "Miss Dianne", race #6, as well as Cris Ferguson's "Let The Good Times Roll", race #20. Check back often for updates as we update this page with more news from the recent Reno Air Races and our plans for the 2008 campaign. Past results for the Flyin' Lo Racing Team, including Miss Gianna, Miss Dianne, and Ole Eight Lima are available here. The Flyin' Lo Racing Team gets a lot of help fielding our racers from our sponsors. Visit the sponsor page to learn more about them. You can contact the Flyin' Lo Racing Team at jlo@pacbell.net. You can find out more about the National Championship Air Races from the Reno Air Racing Association. Check out news and discussions about air racing at All Aviation Flightline Online (AAFO) and Warbird Aero Press.